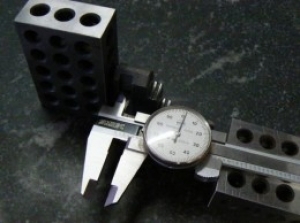 Homemade caliper measuring setup utilizing 1-2-3 gauge blocks. Measurement is done on a surface plate to ensure that the caliper is measuring at right angles to the workpiece. Seemingly simple setup, but when accuracy is paramount, this is one way to do it.